Sovan Boun Thuy, left, of Chez Sovan Express in Restaurant Row, helps guide a customer to the drinks. With her are daughters Kelly Nou, middle, and Laura Chum. Sovan Boun Thuy has always loved feeding people. That's been good news for hungry people in California in the 21 years since she opened her first restaurant in San Jose. For the past four years, she and her family also have filled the stomachs of Honolulu's lunch crowd with signature dishes such as amok curry and noodle soup. Cooking is a self-taught talent that Thuy, 66, has perfected at the three restaurants she started after arriving in Long Beach, Calif., from Thailand in 1975 with little money and five children. Thuy's youngest child, Laura Chum, 30, and Chum's husband, Edison Beltran, now help her run the Restaurant Row location, while her second son manages her first restaurant in San Jose. All of Thuy's now-six children have worked at her eateries. Her restaurants are something she wants to keep alive for years to come. "I would like to help pass it down from generation to generation," she said. » Where: Restaurant Row, 500 Ala Moana Blvd. 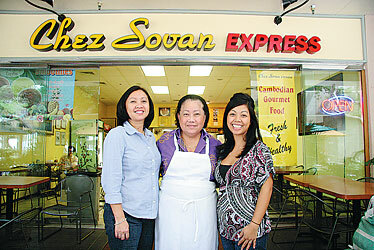 Sovan Boun Thuy, of Chez Sovan Express in Restaurant Row, cooks in the kitchen. "I was not sure people in the United States would like my food," she recalled before opening her first restaurant in 1987. When Sovan Boun Thuy opened her first restaurant in a ramshackle area of San Jose, Calif., in 1987, she worried few Americans would eat the native Cambodian fare she had cooked all her life. "I was not sure people in the United States would like my food," she said. She was partly right -- the tiny corner restaurant drew only a few dozen people each day -- "mostly bums, the homeless" she said. "I came here bare-handed, right? So I looked for a cheap (location)." That changed when a friend from the San Jose Mercury News newspaper, where Thuy helped translate Cambodian interviews for reporters, begged her to cook what she knew best. Those noodle soups and amok curries are now the staple dishes served at her newest location, Chez Sovan Express, at Restaurant Row. The restaurant, opened by Thuy's eldest daughter Kelly Nou, celebrates its fourth anniversary this winter. Not much has changed from the initial recipes perfected two decades ago in California -- lunch items range from the popular curry chicken to stir-fried vermicelli noodles and cost less than $10. "I see people eat good and I'm happy," Thuy said. "I like to feed people. It has always been that way, since I was born, I think." 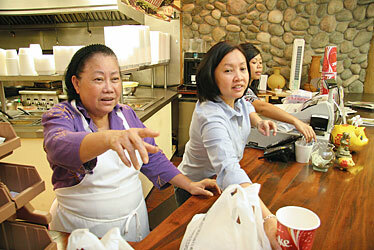 Thuy, 66, runs the restaurant now with her youngest daughter Laura Chum, 30, and Chum's husband, Edison Beltran. She spends seven days a week prepping, preparing and shopping for food. Maintaining the restaurant, which costs more than $7,000 a month in rent and utilities, is expensive and time-consuming, she said. "We try to tell her to relax a little bit," Chum said. "She enjoys her work so much." 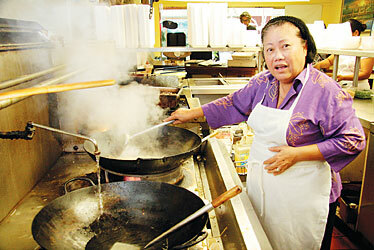 Chum has worked in Sovan's eateries since she was a teenager, first in the original restaurant her brother still owns on Oakland Avenue in San Jose and then in Sovan's second -- and much bigger -- location in the city's Campbell neighborhood that Thuy opened in 1990 and sold to a friend upon moving to Hawaii in 2005. All of Thuy's six children have worked in her restaurants, as well as her now-retired husband, Ytthan Chum, 68, who once served in the Cambodian air force. Thuy, middle, with daughters Kelly Nou, left, and Laura Chum. "We can fight and bicker all we want, and I can't get fired," Laura Chum said. "It's nice. It's family. We kind of work on our own pace at our own time. It's a little different." Thuy evacuated her then-five children, ranging in age from 1 1/2 to 11 years old, to Long Beach, Calif., in 1975 after the communist Khmer Rouge and Pol Pot took over Thailand, where she had been living with her husband for five years. A member of the Cambodian army, he was killed when he returned to Cambodia that year for work. "My house, my farm over there -- they took it," she said. "I cannot take it back. It's OK because we ran away from home." After a year, Phnom Penh, Cambodia-born Thuy moved her family to Washington, D.C., where she met her second husband and had Laura, followed by a move to Portland, Ore., and then San Jose. Thuy said she owes much of her success to a restaurant review published a few months after she opened her first restaurant. "I cried that day. I cried," she said. "People were 15 tables full and outside was a long line. I had only one son help in the front of this small place and one cook inside, that's it." Business has remained strong, drawing praise from foodie bloggers throughout the Bay Area. "It was very successful," she said. "And then too many people were looking for my food, so I eliminated the hamburger."